Two flagships but which is best for you? The Samsung Galaxy S8 is officially the best smartphone currently available, but how does it compare to Apple's latest handset? There's tough competition out there right now for your next phone upgrade, and the Galaxy S8 is designed to directly rival the iPhone 7. That begs the question, which is really better? Here’s how Samsung's best stacks up to Apple’s flagship from six short months ago. 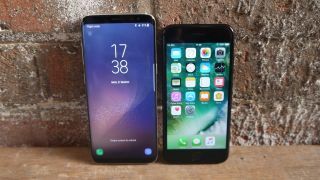 Want to see the iPhone 7 and Samsung Galaxy S8 compared in video form? We've taken a look about both of the phones - as well as the Sony Xperia XZ Premium - in the video you can watch just below. The Samsung Galaxy S8 has a glass back and a metal frame, with the glass on both sides gently curving, to give it a symmetrical look and making it comfortable to hold in the hand. The iPhone 7 has a quite different but similarly premium design, with a metal unibody that’s slim and compact at 138.3 x 67.1 x 7.1mm, while the Galaxy S8 is 148.9 x 68.1 x 8mm. That makes the iPhone 7 quite a bit smaller than the Galaxy S8, but it's still as easy to hold in the hand and use one-handed as the device from Apple. Still, the iPhone 7 is the more compact phone. It’s also one of the best-looking phones around – but the Galaxy S8 is also in that category. The S8 is also IP68 certified, making it slightly more water-resistant than the IP67 certified iPhone 7. Plus the Samsung Galaxy S8 comes with a 3.5mm headphone jack so you can use wired headsets with the phone. You won't get that with an iPhone 7. The Samsung Galaxy S8 has a 5.8-inch screen, which is massive and means it dwarfs the 4.7-inch iPhone 7. Hold these phones together and you'll really notice how much smaller the iPhone is compared to this Android handset. It's not just the sizes that differ. The Samsung Galaxy S8 also uses Super AMOLED, where the iPhone 7’s screen is LCD – meaning Samsung’s phone offers more vivid, high-contrast colors. When holding these two screens together, you can really notice the difference on the Galaxy S8 compared to the slightly duller iPhone 7. The Galaxy S8 also has an incredibly sharp screen, with a resolution of 1440 x 2960, where the iPhone 7 is limited to 750 x 1334. The Samsung Galaxy S8 has the benefit of a curved screen at the edges too, while the iPhone 7’s is flat. The S8's look is a lot like the Galaxy S7 Edge, but that's no bad thing. The S8 also supports HDR content, which the iPhone 7 doesn’t. Samsung's flagship also has a different aspect ratio, at a very widescreen 18.5:9, with the iPhone 7 a more standard 16:9. In short then, the screen is one of the biggest differences between the two phones, and one where the Samsung Galaxy S8 has the much higher spec in nearly every department (apart from the more subjective display technology). But the iPhone 7 still has a high quality display, and while iPhone 8 rumors point to a big size increase, not everyone is going to want a huge 5.8-inch option right now. The operating system is where the battle lines are drawn between these two phones, with the Samsung Galaxy S8 running Android Nougat and the iPhone 7 using iOS 10.3. Both phones are tremendously powerful though. We know for a fact that the iPhone 7 is the most grunt-worthy handset from Apple yet, with its Apple A10 Fusion chip and 2GB of RAM. The Galaxy S8 is confirmed to ship with 4GB of RAM, while we don't know exactly what the processors are yet but it's rumored to be either a Snapdragon 835 chipset (in the US) or an Exynos 8895 one (in most other places). Those are both top-end chips, so we expect silky smooth performance in both and perhaps Samsung to at least match the iPhone in terms of screen response under the finger. The Samsung Galaxy S8’s camera is much the same as the one the Samsung Galaxy S7 has. There's a 12MP sensor with f1.7 aperture. It's a good setup but might not hold up against the best in 2017. The iPhone 7’s camera is no slouch either. It’s a 12MP one too, and benefits from optical image stabilization, which the Samsung Galaxy S8 has as well. The Galaxy S8’s front-facing camera is also slightly more capable, with an 8MP sensor, where the iPhone 7’s is 7MP. The Samsung Galaxy S8 has a 3,000mAh battery. That would make it a lot bigger than the iPhone 7’s 1,960mAh battery, but then the S8 is a much bigger phone with a high resolution screen, so it needs more juice. We can’t predict exactly how long-lasting it will be, but the iPhone 7 requires a daily charge, and sometimes doesn’t even make it through until bedtime, so the Samsung Galaxy S8 has a good chance of going further daily. The S8 is also supports fast charging. The iPhone 7 can also charge quickly, but only if you plug it in to a 2.1A iPad charger, rather than the plug that comes with the phone. The Samsung Galaxy S8 costs a lot more than the iPhone 7, coming in at a new high of $729 in the US, £689 in the UK and AU$1,199 in Australia. Ouch. The iPhone 7 meanwhile starts at $649/£599/AU$1,079. Samsung Galaxy S8, in a twist, costs significantly more than Apple’s flagship. But then again, there's only a 64GB version of the Galaxy S8, while the iPhone 7 starts with 32GB of storage. So it's technically a better entry-level value. There is no 64GB iPhone 7 model, but even the 128GB one comes in at $749/£699/AU$1,229, which is comparable in the UK and still cheaper than the rumored S8 price in the US. The iPhone 7 is one of the best phones on the planet, but the Samsung Galaxy S8 has some neat new tricks to give it the literal edge. Beyond the obvious operating system differences, the Galaxy S8 has a larger, sharper and better screen, a very different – but similarly premium – design, and a higher price tag. Differences in the camera and performance may be harder to spot, and battery life is about the same. You can't go wrong with either in these areas.. Going purely by specs, the Samsung Galaxy S8 looks to be the slightly more powerful phone – but the spec list isn't everything, and you'll have to pay an eye-watering price to get it.